Do you remember those chocolate nests I made last Sunday? Well, they hatched. 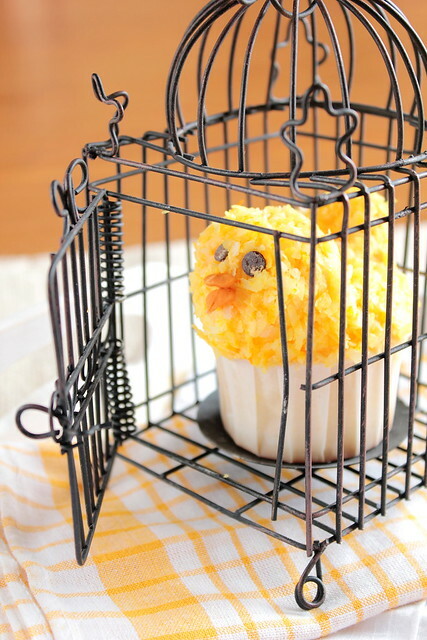 Okay, maybe they didn't hatch per se, but if they actually did wouldn't that be just about the greatest thing ever? 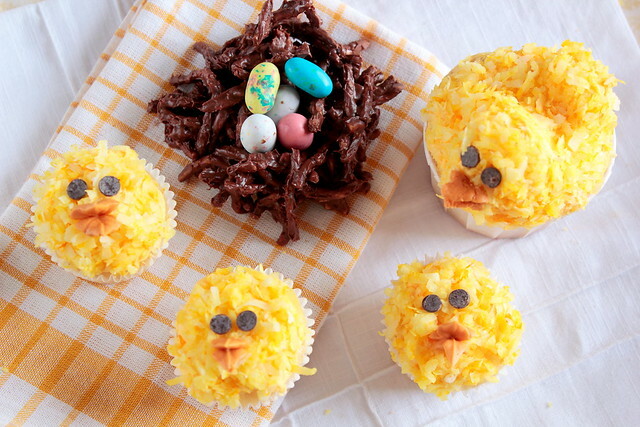 You slave over the world's simplest (and easiest) cookie recipe to make a batch of chocolate nests full of candy eggs and head off to sleep, only to wake up the next morning to find that your eggs have hatched into a bunch of cute baby cupcake chicks. Mama Chick is protecting her precious eggs from the dangers of nature (and sneaking fingers). Be careful; she might peck you if you get too close. Once the little peepers hatch, they get hungry. Feed them gummy worms to stop the chirps. Now that I think of it, that might look too adorable (is there such a thing?). In any case, I'll caution you on this one. Do it at your own risk. Cute overload is a real threat. I love the little chick on the left; he looks like he's puckering up for a big kiss. These chicks remind me of the song Chirpy Chirpy Cheep Cheep. It's probably best that you don't ask me why I know all the lyrics. If your little chicks are growing up too fast for your liking (they were tiny peeps just a moment ago!) and start to fly the nest, you can always lock them up. Keep them safe from the dangers of the world (and hungry stomachs) for just a little longer. This is also effective in keep wandering hands from touching your afternoon snack. In my biased opinion, I think these chicks are just too cute. I literally squeal in delight whenever I see them and then proceed to coo and peep at them for several minutes until I come back to my senses. Then, I eat them. They are cupcakes after all. I played around with the size of the cupcakes when making the mamas, papas, and little peeps, which I think made all the difference. 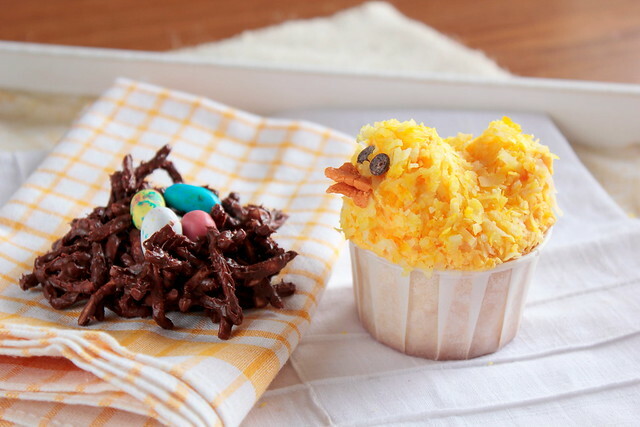 These Easter chicks are surprisingly easy to make. Young children could tackle the baby peeps with relative ease (they might need a little help on the beaks) while the older ones could try their hand at the big chicks. 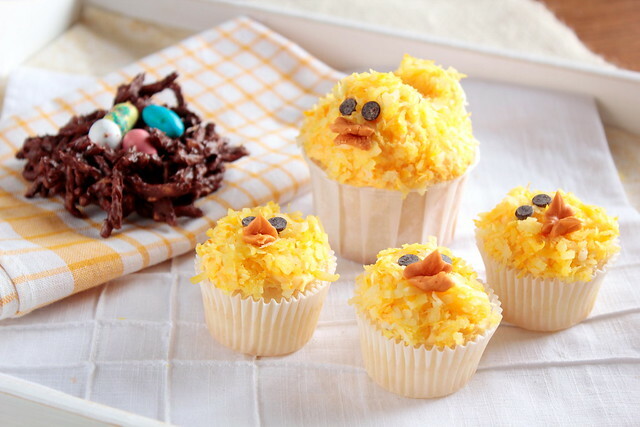 The bigger chicks are formed by molding marshmallows and attaching them to the cupcake with frosting. I've always been hesitant to try out elaborately decorated cupcakes because the steps were long and complex or I didn't have all of the ingredients on hand (like colored candy melts or certain fruit chews). 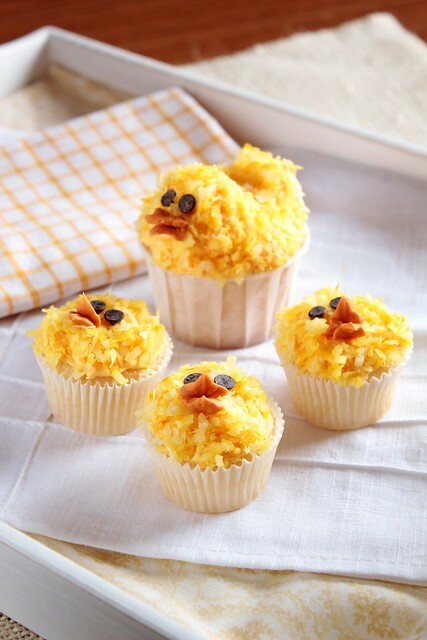 With that said, I can assure you that you most likely have all the ingredients for these chicks in your pantry already. 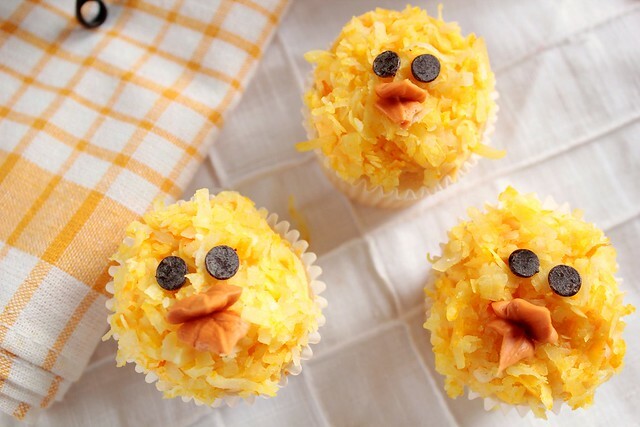 You could decorate a flock of these chicks in a half hour's time (instead of an entire afternoon) without breaking a sweat. 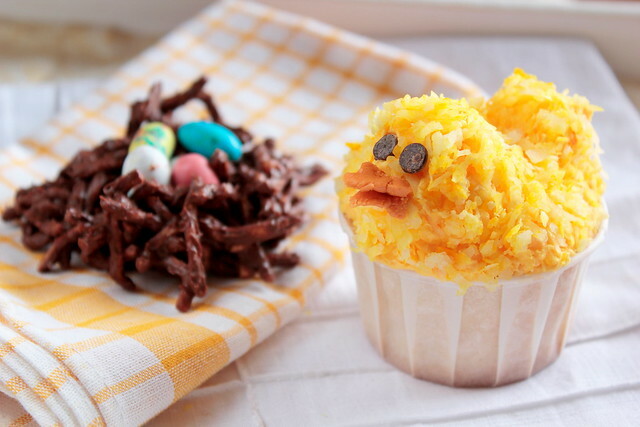 These Easter chicks are cute and practical; what more could you ask for?